Dodrupchen Monastery (Tib. རྡོ་གྲུབ་ཆེན་དགོན་, Wyl. 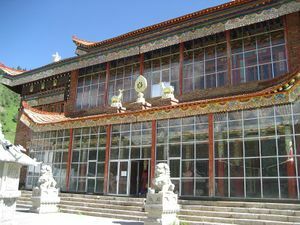 rdo grub chen dgon) is a monastery of the Longchen Nyingtik lineage in Golok, Eastern Tibet, founded in its current location in 1862 by the second Dodrupchen Jikmé Puntsok Jungné in the Tsangchen plain in the Do valley. The First Dodrupchen Jikme Trinle Özer had first laid the foundation for a monastery called Drodön Lhündrub Gompa at Shukchen Tago, about ten miles from the present Dodrupchen monastery, but then left for other matters. He resumed building in 1799, where he was assisted by Jikme Gyalwe Nyugu. Then in 1810 the First Dodrupchen established another meditation centre at Yarlung in Serta. He named it the Pemako Tsasum Khandro Ling (pad+ma bkod rtsa gsum mkha' 'gro'i gling), which became known as Yarlung Pemako Monastery. After building it Dodrupchen Rinpoche vowed never to leave it again. When Gönpo Namgyal, a warlord of Nyarong, attacked the Ser valley, the Second Dodrupchen Jikmé Puntsok Jungné had no choice but to flee the monastery. He then settled in the Tsangchen (rtsang chen) plain in the upper Do Valley, and this became the location of the current Dodrupchen Monastery. 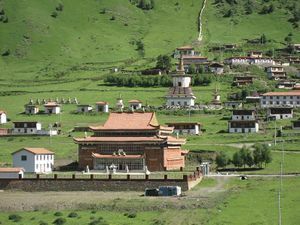 Dodrupchen monastery has been founded in exile by the Fourth Dodrupchen Tubten Trinlé Pal Zang, and is called (Deorali) Chorten Gompa (deorali mchod rten dgon pa). ↑ See Tulku Thondup, Masters of Meditation and Miracles, page 155. 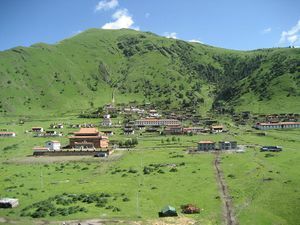 Tulku Thondup notes that Yarlung Monastery is being rebuilt under the guidance of Yarlung Tulku Tenpe Nyima, an incarnation of the Third Dodrupchen. This page was last edited on 3 April 2019, at 04:39.